BANGI, 20 Oct 2012 – A product that stems from innovation and research should be affordable for it to be marketable, an Honorory doctorate recipient from The National University of Malaysia (UKM) today said. The McLean Chair Professor, Provost and Vice President of Stevens Institute of Technology (SIT), Professor George P. Korfiatis, said no matter how great an innovation or a technological invention is, if it is not affordable it will not benefit those who need it. 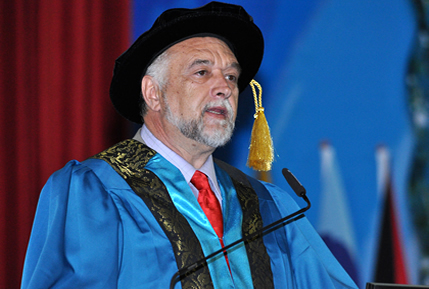 Prof Korfiatis was conferred an Hon PhD (Entrepreneurship and Innovation) by the Pro Chancellor of UKM, Tengku Tan Sri Dato’ Seri (Dr) Ahmad Rithauddeen Al-Haj at the second session of the 40th UKM Convocation here this afternoon. Prof Korfiatis played an important role in strengthening the UKM-SIT relationship by elevating the collaboration programme to a higher level. His capacity-building initiatives anchored on the development of the UKM curriculum for Academic Entrepreneurship has been regarded as invaluable to UKM. Speaking to UKM Newsportal after the confirment, he said it was very important that innovations take into account the question of affordability. He said even if an innovation is cheap, that does not mean that it cannot generate income for the country. On the contrary, because it is affordable it is accessible to the masses and that creates greater volume resulting in greater revenue. He gave an example of how a water purifying technology developed in SIT was successfully marketed in Bangladesh. Initially the technology was too expensive to be sold to a Bangladeshi household. But the technology was perfect for them because water in many of the wells there are contaminated with arsenic. Prof Korfiatis and his team get to work on producing a more affordable system and after three years they managed to bring the cost down substantially thus making the technology affordable. He said commercialisation of an innovation or research finding is a long process and the concept of academic entrepreneurship is relatively new. He recalled when he first started to introduce the concept it faced quite a resistance. “Whenever we put one good argument, an academician can give five arguments why it cannot work,” he said. After 20 years SIT proved that academic entrepreneurship is necessary not just for the benefit of the researchers but more so to the people who need it the most. Commercialisation is a long process but UKM is on the right track and doing a good job in terms of awareness though it still has a long way to go, Prof Korfiatis said. He views that Malaysia needed to go beyond innovation in fields like agriculture while intensifying innovation in the field of technology.